Given all the doom and gloom in the rest of the DC Extended Universe, the blast of unabashed fun contained within this cartoon spin-off comes as a delightful surprise. Based on the cult Cartoon Network series that premiered in 2003, it's a riot of self-aware superhero japes that delivers plenty of big laughs. 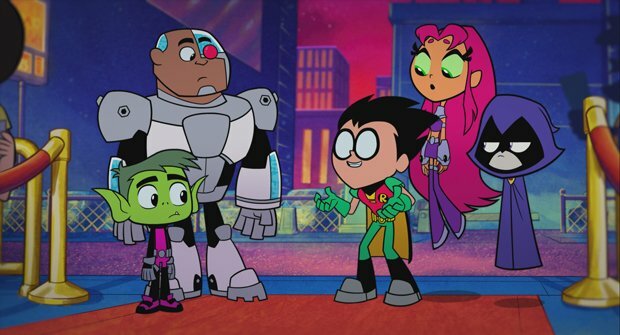 After a battle with the inflatable Balloon Man (voiced by Greg Davies) that ends with a protracted fart joke, the Teen Titans – Batman's sidekick Robin (Scott Menville), half-man half-robot Cyborg (Khary Payton), alien princess Starfire (Hynden Walch), shape-shifter Beast Boy (Greg Cipes) and mystical Raven (Tara Strong) – head to Hollywood for the premiere of the latest Batman movie. Realising that all the big players in the DC Universe have their own films, the super-friends resort to increasingly desperate measures in order to persuade hotshot director Jade Wilson (Kristen Bell) to make one about them. Directors Peter Rida Michail and Aaron Horvath ensure that the jokes come thick and fast, with brilliant blink-and-you'll-miss-them sight gags packed into every frame (e.g. a poster of Superman with a moustache). Similarly, the oh-so-meta script adopts a take-no-prisoners approach, including gleeful swipes at pretty much every superhero-related target going: from moody origin stories to Hollywood's apparent obsession with Batman. There's even a Stan Lee cameo, though he quickly realises he's in the wrong cinematic universe. Teen Titans is consistently inventive, whether switching animation styles for comedic effect (most notable during a Lion King-inspired nightmare), indulging in ingenious movie spoofs (including a hysterical take on Back to the Future), or busting out a pair of ultra catchy songs. Best of all is a brilliantly timed closing gag about the need for the film to pack its audience off with a final message. Lively, colourful and very funny, this is a treat for kids and adults alike. General release from Fri 3 Aug. Disgruntled that so many big players in the DC Universe have their own movie but they themselves don’t, the Teen Titans pressure hotshot director Jade Wilson (Bell) to make one. Inventive and very funny animated superhero comedy which is a treat for kids and adults alike.